Another way to back up SQL is by using the native backup function of SQL to create a flat file backup, which can then become the target for a separate backup application if necessary. This method is especially useful if an environment already has a centralized backup infrastructure that doesn’t support SQL natively. The sample backup procedure that follows is based on SQL Server 2012; however, the steps are very similar for SQL Server 2008 R2. 1. Log on to the server where Lync Back End databases are installed using an account with SQL administrative rights, and open SQL Server Management Studio. 2. At the Connect to Server prompt, keep the default options of connecting to the local server with Windows Authentication, and click Connect. 3. Expand Databases in the left pane. 4. Right-click on the database you want to back up, select Tasks, and click Back Up. 5. 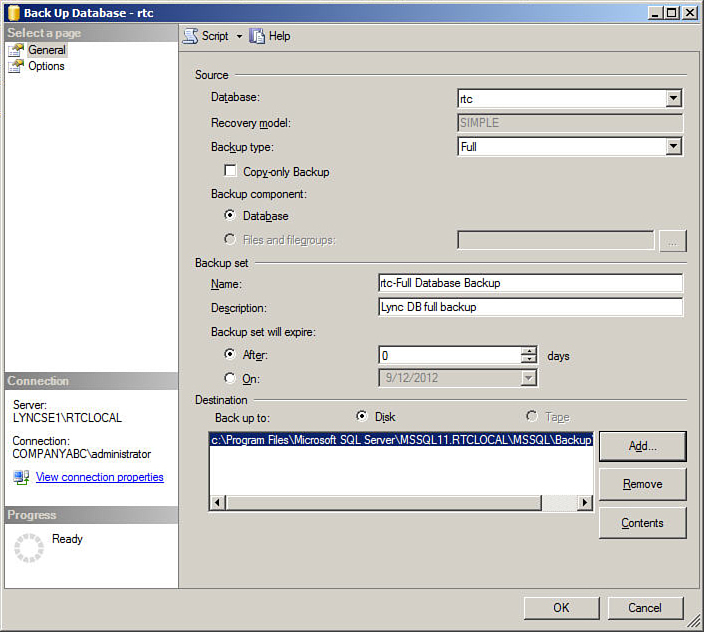 At the Back Up Database screen, the first set of options for the backup job appears, as shown in Figure 1. In the Source section, select a backup type of either Full or Differential, and select the Copy-Only Backup option if desired. In the Backup Set section, either keep the default name for the backup set or enter an alternative name, along with a description if desired. Also, you can choose a backup set expiration date if necessary. In the Destination section, either keep the default backup destination, which is the standard SQL Backup directory on the local system, or click Add and specify an alternative destination. Figure 1. SQL backup options. 6. Click Options in the left pane to view a second set of options for the backup job, as shown in Figure 2. In the Overwrite Media section, several media set options are available, which will determine whether the backup data will append to or overwrite an existing backup set, or create a new media set. In the Reliability section, options for backup verification, checksums, and error handling are available. In the Compression section, one of several compression options can be selected. After making the desired selections, click OK to start the backup job. Figure 2. Additional SQL backup options. 7. When the backup has completed, click OK.